You may remember this coat from the lavender sweater and white jeans post. J.Crew carries some version of this coat pretty much every year because it’s that good. Well, guess what??? Right now it’s 35% off PLUS an additional 50% off THAT, bringing it down to $115! It’s starting to sell out, but there are still quite a few sizes left at the time of this posting. I tend to be the girl who wears the same coat all the time for every occasion, but lately I’ve been trying to add a few classic coats to my closet so I have more variety. After all, this time of year, your coat is often the only part of your outfit people see! I decided a grey coat would be a nice wardrobe addition so when my mom asked me for Christmas gift ideas, I suggested this coat. A wool coat levels up an outfit in a way most puffer coats don’t — although I still wear and love my puffer coats. They’re by far the best coats for the coldest weather days, but a wool coat is more versatile because you can dress it up or down. For size reference, I have this coat in a 6 and it’s roomy. I can easily wear it over a chunky sweater or even over my leather moto jacket if I want to. I usually wear a 6 or 8 in coats, so I would say it runs true to size, or a little big. If at all in doubt, size down. Underneath, I’m wearing this black and white striped cashmere sweater and black jeans. At first I was unsure about this top because stripes can do funny things, but I really love the wide black trim at the v-neck and cuffs, and it’s just so comfortable. It’s a great price for cashmere, too, at $69. You can appreciate the wide black band at the waistband more when it’s paired with white jeans or blue jeans, but I also like it with the black. I got these AG jeans at Amazon, believe it or not! And actually, that’s where I got this Rebecca Minkoff satchel as well. I’m really impressed with Amazon Fashion these days, and it’s only getting better. They recently partnered with Shopbop, which means even more designer brands are available with Amazon Prime. You can see all my Amazon Fashion picks here if you’re interested. I also added my Amazon Influencer page to the SHOP tab on my menu bar. My biggest tip for shopping Amazon Fashion is to know your prices, or at least compare to other sites before buying. Sometimes you can get good deals, and sometimes the prices are higher than they are elsewhere. Oftentimes the price on a single item will vary by style and color, so pay attention to that too, but the convenience of Amazon Prime shipping & returns is really sweet! I love the contrast of the light grey coat against the black and white outfit, and the red scarf adds the perfect punch of color to brighten up these dreary winter days. Unfortunately my exact scarf sold out. Nordstrom has had this scarf for at least two seasons. I got it in grey last year, and I liked it so much that I bought it in red this year — both times it was 40% off. I actually think infinity scarves may be on their way out… I haven’t seen them as much this year, but this traditional fringed cashmere scarf is 40% off and comes in both red and burgundy. Other closet basics included in this look are my pearl earrings and Maui Jim sunnies. I finally invested in real pearl earrings because I wear them SO much and I plan to have them forever, but these glass pearl post earrings are a great dupe for $18. Because so much of this outfit is classic, I wore a fun choker with hoop drop to give it a little pizzazz and keep it from being too safe. I wore black over-the-knee boots with this outfit for this post, but I wore the same outfit with ankle boots to meet a friend for drinks last weekend, and I like it both ways. I was able to snag my OTK boots for 60% off at Bloomingdale’s during a clearance event, but I can’t find them anywhere now for that low of a price, although they’re 40% off on the Stuart Weitzman website, which is still a pretty good discount for this brand. I’ve also linked to a few similar-for-less styles below. I really like the classy effect the grey cocoon coat has on this outfit. Here’s a view without the scarf. It’s definitely a cleaner look, but I really miss that pop of red — although I did a red lip, so that helps! What I love about this outfit is everything I’m wearing is a quality piece that can be mixed and matched with other items in my closet for a variety of looks for all occasions. Best of all, most of them are currently on sale! Jo-Lynne, I absolutely love this coat! The color is gorgeous and so versatile. And your cashmere sweater is gorgeous. I am really digging that choker style necklace on you, too! Have a fantastic weekend! I am looking for a gray coat too! this is such a classic winter look, i finally picked up a cocoon coats during all the sales. You look like a chic French woman. Love this! That’s such a timeless coat that you can wear for many, many years. Heck, you may be passing it down to your daughter at some time, LOL!! I love a sleek dark outfit with a pop of a light beautiful color the way you did in this look. That coat is so fabulous and looks nice and warm. Happy Friday! Such a classic and polished winter look! I have been following your blog for awhile and really enjoy it. I recently took the adore your wardrobe course and was wondering what your body type is? I am a #shortwaistedpear warm. It helps me understand what may work for my body type. Keep up the the good work. Your suggestions for buying at Nordstrom during their sale was amazing. J Crew Factory has an almost identical coat called the City Coat. Final clearance was 50% off yesterday so mine was $60! They kept updating colors and sizes during the day. I called customer service and they found the size and color I wanted and shipped it to me for free! I love this whole outfit but it’s your red lip that really makes it pop! You look really pretty! FABULOUS outfit and look on you, from head to toe! If I were in a climate where I could get a lot of wear out of a cashmere sweater, that is the one I would buy. We don’t have any fun planned for the weekend, since Larry cannot be around anyone, but me. And he feels too bad to do anything. I’m hoping he turns a corner this weekend, since he’s now on 2 antibiotics. I don’t want him to end up needing antibiotics via an IV and hospital admittance. Have fun this weekend! Yeah, I do read reviews and pay attention to who the vendor is. Some look questionable, but sometimes you’re actually get it from the retailers or a store you recognize… like Zappo’s or Shopbop. Ultimately you can return things for free, so I feel like it’s low-risk. If I don’t think something is legit, I send it back. Wow!! You look absolutely gorgeous here!! The burgundy scarf, matching lips and your dark hair against your light skin is just incredible! I hope your photographer got a close up. I also like the over the knee boots-super sophisticated and you look so long and lean. I got really excited when I first saw the v-neck and thought it was a T. It’s super flattering, but I’ve had problems with Halogen, so I’ve vowed to stay away. It can be hard, b/c there are some cute pieces. I have way better luck with Caslon, but the selections are much slimmer. Happy Friday!! Good morning Jolynne. I just watched your FBLive from Wednesday. Thank you for answering my questions. All your info was very informative. I may not always watch them live but it’s nice knowing I can go back later and still see it. Have a great weekend! You too, Brenda! So glad you enjoyed it. Love this outfit!! Timeless, classic. And you look fabulous, Jo-Lynne!! A classic outfit, for sure. But the OTK boots and choker lend a little edge to what would be fairly conservative. Loving it! I’ve looked at that JCrew coat a few times this winter but have resisted, as I already have several coats and jackets to choose from. It’s one that you’ll wear for years. Great post. You look amazing and the outfit is so classic and like you said can be used so many different ways. I just watched your live cast you relinked and it was fun. I’m glad even though I don’t have Facebook, I can get it on my iPhone. Is there anyway you can link the the one before this last one. That is the one I had emailed you about that I started and got interrupted and didn’t get to finish. It was the one you said went over 45 min. Closer to an hour? Anyway, if too confusing to find, don’t worry about it, I know you are busy and there will be more live. Have a good Friday and have a great weekend. Love how real you are. 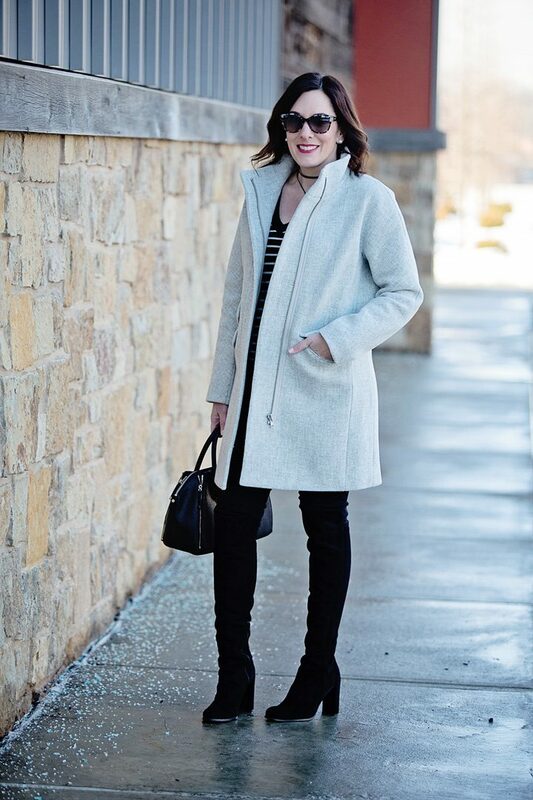 I love a roomy gray coat—I’m wearing one in my outfit post this week! Happy Friday to you! That is a gorgeous coat. Looks really pretty on you! That coat!! Gorgeous and great color on you. I totally agree with you on Amazon fashion-the prices can really fluctuate but sometimes you can snag a great deal, or…I’ve found out of stock items at Amazon at times too. Yes, I often find out of stock items there! Beautiful classic coat! I do love a roomy coat that you can wear over a chunky sweater.